This brief uses a sample of over 1,000 reentering men in five states to examine reentry success. 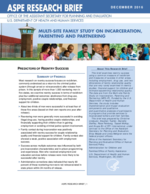 The analysis uses a common measure of recidivism as well as measures of success in other areas, including employment, drug use, and two dimensions of family relationship quality that are very rarely examined in reentry studies: financial support for children and intimate/coparenting relationship quality. The results suggest that most men were successful in at least four of the measured areas and that family contact during incarceration was positively associated with reentry success. Further, administrative corrections data indicated most of these men were not reincarcerated in state prison within 24 months of release. The findings from this study help to broaden our understanding of successful reentry and identify areas for intervention with factors that are amenable to change.